Since it was first introduced I've subscribed to "Paper Pumpkin" – it is a complete and fully designed crafting kit that is delivered to your mailbox every month. It always comes with at least one 1" Stampin' Spot ink cube and an exclusive photopolymer stamp set. It is often a set of cards but this month it is a really cute 3D item. Little tubes to fill and decorate for Halloween or Fall. The kit has 16 tubes! 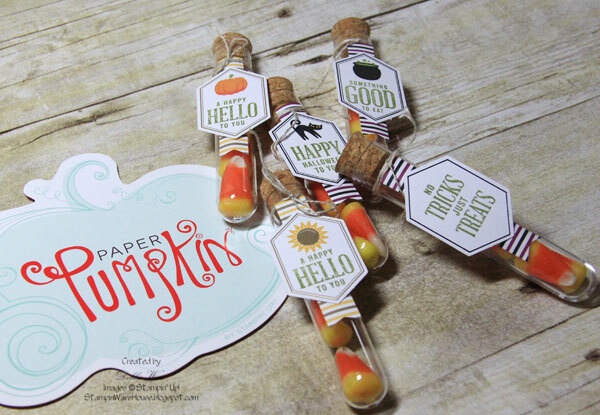 I made a few and filled them with candy corn. So cute! My grandsons will love them. Here is a look at some of the supplies that come with the kit – enough to complete all the tubes and left over pieces too. While I love them, I didn't want to make all 16 tubes for Halloween so I went to work on making some alternate projects. My first thought was to fill with some of my favorite embellishments. Now they are in a cute little jar I usually keep my green glue in and close at hand! I made a card, using a few additional supplies – Old Olive & Basic Black Card Stock and Basic Black ink. Notice I used the "scrap" part of the banner stickers for a vertical line on the card. The last project is what I'm going to use for place cards on my Thanksgiving table. I put a bit of confetti in the vial for now, but I'm going to figure out something else (when I'm a little more mobile). I cut a strip of Whisper White paper to layer onto the sticker banner and tied that on with some gold thick baker's twine from the Baker's Twine Trio Pack. 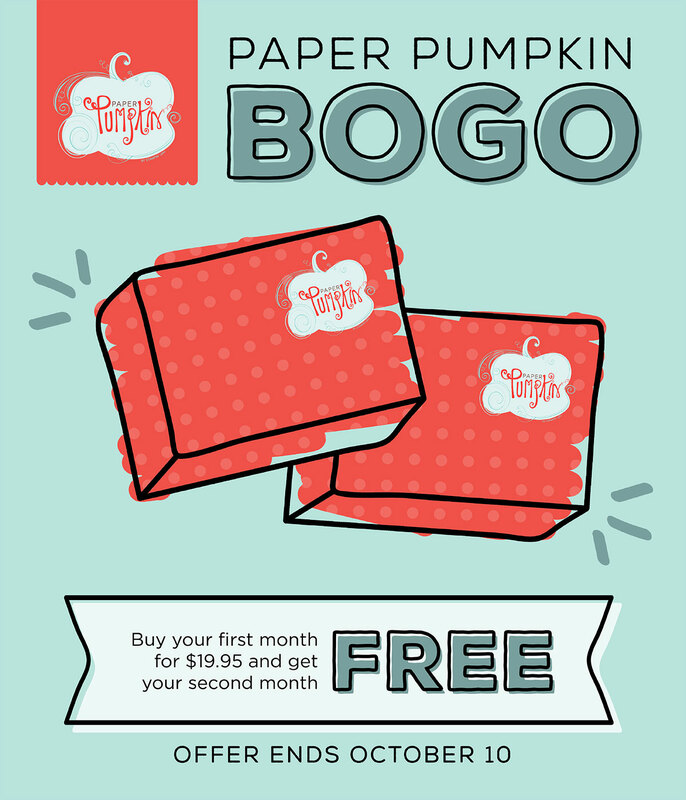 So are you ready to try Paper Pumpkin or do you know someone who would love it? 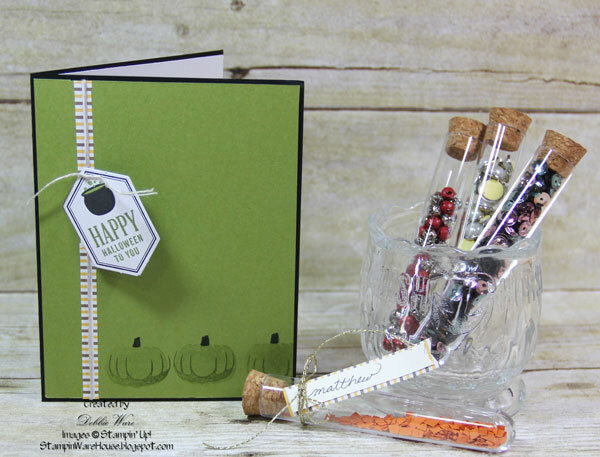 From now through October 10 when you buy the next kit at $19.95 (that includes shipping) you get November free! 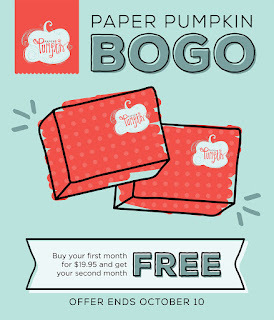 Just enter BOGO at checkout and select me as your demonstrator. 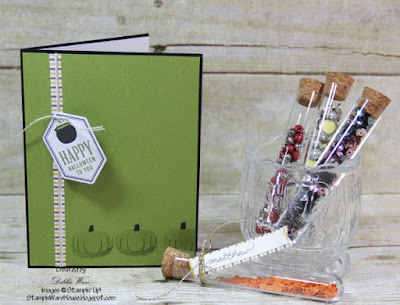 Check out the Stampin’ Up! Paper Pumpkin YouTube channel to see past kits. 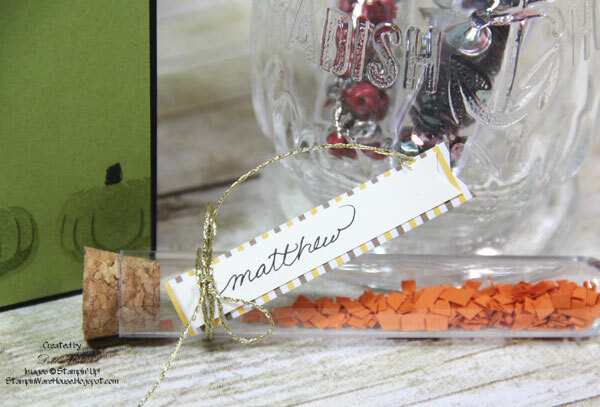 This is perfect to give as a gift to a new stamper, but fun for the experienced stamper as well. If you love it, you can order a discounted 3, 6 or 12 month subscription from me or continue it month-to-month. But you can cancel after you receive your November kit with no further commitment. 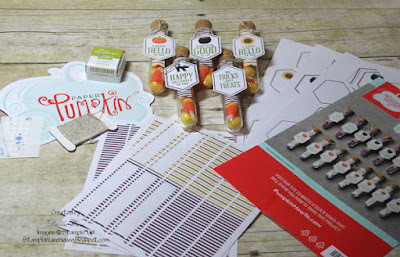 Another advantage to being a subscriber you get to order kit refills when Stampin’ Up! makes them available.